The Nevil Shute Centennial Celebration was conducted January 15 through January 17, 1999, to coincide with the 100th anniversary of the author's birth. It was the first such convention ever held in his honor. The Centennial was held in Albuquerque, New Mexico. It was attended by approximately 120 people from Australia, Canada, Ireland, the United Kingdom and the United States. Participants ranged in age from eighteen months to the seventies, with a good spread in between. Occupations and professions represented included a fair sprinkling of professors, engineers, business people, scientists, writers and retirees. Approximately one third were pilots. From a gender standpoint, participants were fairly evenly split with 67 males and 55 females. 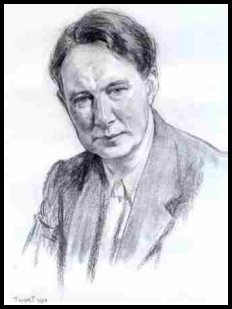 The common denominator was a love for Nevil Shute's philosophy and his work. Among the notables present were Nevil Shute's two daughters, Heather and Shirley, both his grandchildren, and one great-grandchild with another on the way. The noted author Richard Bach also attended, and presented one of the seminars. Financially, the Centennial was more successful than anticipated. We actually come out $1,200 to $1,300 ahead! This profit was set aside to incorporate the Nevil Shute Norway Foundation, set up a lending library, and provide seed money for the next celebration, planned for Australia in 2001. The day following the Centennial, while still in a state of euphoria from which I have never fully recovered, I wrote a narrative report of the celebration to my extended family. Slightly modified to take out a bit of personal information, it appears below. Whatever I can say now about the Centennial will be an understatement of how I actually feel. Thursday afternoon, the day before the Centennial officially opened, I met one of Nevil Shute's two daughters, Shirley Norway, for the first time, and we spent some time going over the items she had brought for display. Even though she was tired from her trip, and suffering from a miserable cold, she was gracious and charming. We designed a really nice display of Nevil Shute memorabilia. Thursday evening, John Henry (President of the NSN Society) and his wife Nellie, my wife Zia and I, all went to dinner with Don and Heather Norway Mayfield (the other of the two Norway daughters). Heather treated us to dinner at Gardu�os, one of the many fine New Mexican restaurants here in Albuquerque. We managed to have some very interesting conversations over the mariachi music. When all was said and done, the entire Norway clan was at the Centennial - Nevil Shute's two daughters, his son-in-law, his grandson and wife, his granddaughter and husband, and his great granddaughter. A second great grandchild also attended, safely tucked inside his/her mother, patiently awaiting his/her introduction to the outside world. The next day, Friday, we had our reception area, museum display and vendor areas set up by 10:00 AM. We had around a dozen volunteers covering the reception and vendor areas and a three person crew covering videos and posting event signs, etc. At noon, we started accepting check-ins, and opened the museum and vendor areas. At 2:00 PM, we began the video "film festival" of Nevil Shute movies, showing three simultaneously in different conference rooms. The largest was set up in theater style with a 35" television, almost the size of a small projector screen. The movies in that room were the old ones, some of which are not available anywhere, and one of which had never been shown in the US. I love those old films, but didn't know how much other people would enjoy them. In short order, the conference room was packed, and people brought chairs into the hall outside so they could watch the movies through the doorway. A number of people watched two movies before our cocktail reception and went back to watch a third one after the reception. While the rest of us were registering or watching movies, Johan Bakker and his lovely bride Carol took advantage of the occasion to be married, with Shirley Norway acting as witness. We had the reception from 6:30 to around 8:30 PM. It was set up with a generous hors d'ouevres spread, a no host bar, and a dozen or so round tables, seating ten people each. The place was packed with over 100 people -- conversations far overshadowing the drinking. After we were finaIly forced out by the hotel staff, I heard one man mention to another that, if the only thing he got from this was the time he had just spent with the other people at his table, it would justify the trip. The museum display was a great success. 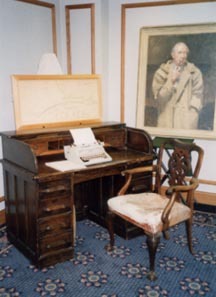 We had Nevil Shute's desk at which he wrote most of his books, his chair, the only oil portrait ever painted of him, his early books as well as books by both his parents, copies of all his unpublished manuscripts, his first pilot's license (one of the first 1,000 issued in the UK), the first thing he ever made as a ground engineer apprentice (a wooden propeller), etc. We did not have his actual typewriter, but Shirley Norway went to a typewriter museum here and picked out one exactly like the one he had used in his later years. They were kind enough to let us use it for the display. The whole thing was set to look like the study in which he wrote his books. I took a copy of the manuscript he was working on at the time of his death, including his hand written notes, and placed it by the typewriter on his desk. I had retyped the last page he wrote (he suffered a fatal stroke while writing there), and I put it in the typewriter. It was quite an effective display. Saturday morning, we had our panel moderators' breakfast meeting and briefing, a continental breakfast for everyone else, opening ceremonies, our first three panel discussions, as well as the continuation of the film festival. All panels and the film festival were conducted simultaneously. The opening ceremonies were very nice with John Henry, and Heather Norway Mayfield giving the introductory speeches. Both presentations were very well received. The panels and film festival were also well attended and well received. After lunch, we continued the panel discussions and the film festival. People also continued to throng the museum display and the vendor areas. Many people had our event photographer take pictures of them sitting and writing at Nevil Shute's desk, or standing beside his portrait. (It is almost life size) We ran out of order forms for the vendor display on several occasions and had to rush to the nearest copy center to have more run off. All the panels went well. Richard Bach, speaking under the name of "James Saunders", was one of the many speakers who did a great job. He spoke of the influence that Nevil Shute has had on his writing, providing an emotional and very touching tribute from one author to another. It was fun to see people gradually coming to realize who he was. He was very gracious, with low key autograph signing, posing for pictures, etc. However, he would not let me introduce him at the banquet nor at any other official gathering. He said that it was a Nevil Shute celebration and nothing should take attention away from that. It seemed the sort of thing that Nevil Shute would have done under similar circumstances. Unfortunately, of the 14 panel discussions we taped, his was the only one that was not successfully recorded. We were using remote microphones and the mike he was using failed at the start of his presentation. In the evening, we had a great birthday banquet with a very nice spread (four entrees to choose from plus related veggies, salads, desserts, etc.). We had a huge birthday cake made with a new technique for decorating that I recently encountered. There is now a machine that will scan photographs and print them, in color, on a frosting wafer. The cake had three aircraft designed and manufactured by Nevil Shute's company, flying against a cloudy sky, and appropriate inscriptions. Everyone seemed duly impressed. During the birthday banquet, commemorative "Namb�" platters were presented to Heather and Shirley. As a reward for my efforts on the Centennial, I was given a three volume set of Plutarch, owned by Nevil Shute. His name plate is inside the cover of all three volumes. I won't bother to attempt a description of my feelings in that regard. The set now has its place in the book case I reserve for the works of Nevil Shute. The dinner speaker was David Stevens, director of the "A Town Like Alice" PBS Masterpiece Theater miniseries. I had been a bit worried about him, since he had a very bad cold and was obviously tired. I need not have worried. He totally wowed the audience. All were spellbound and there were tears mixed in with the laughter. We also videotaped the talk as part of the documentary made of the Centennial. Sunday continued, with a continental breakfast, more panels and more film viewing. We closed out Sunday midday, with short speeches by Heather, Shirley, John Henry and me. We had already decided to have another gathering in Australia in 2001. Rather than announcing the close of the Centennial celebration, I ended the meeting by announcing a two year intermission. Several of the attendees offered to give me an entry fee check there and then for the second half of the celebration. Several days before the Centennial, I was interviewed live by the Australian Broadcasting Corporation, on a local morning talk show in the Canberra area. They contacted me the day before to set up the interview. It lasted 10-15 minutes. Both Heather and I were also interviewed long distance by a newspaper reporter in England. We video taped all the ceremonies and speeches, as well as a lot of background material. We also audio taped all the panel discussions -- quite a feat considering that there were three or four going on simultaneously. The intent was to provide a package for all participants as well as for those fans who could not attend. This was a last minute decision, and added about $5,000 to $6,000 to the cost of the celebration. I seriously doubted that we would break even on this aspect of the Centennial. A few days before the Centennial began, I was contacted by a Fred Weiss, owner of Paper Tiger, who offered to fund the whole thing in return for permission to handle the distribution of the package. He also agreed to offer everything for the same price that I was going to ask for them. He has my undying gratitude for making the taping and documentary possible, and for taking the burden of distribution off my hands. Throughout the celebration, people were thronging the hallways, going about between events, viewing the displays, gathering and talking, etc., with huge grins on their faces. I have never seen a happier crowd. With over 120 participants, from five countries plus Puerto Rico, over a two day period, I did not receive a single complaint nor suggestion for improvement. On the contrary, everyone stopped me to say how wonderful everything was; organization, hotel, transportation arrangements, selection of speakers and topics, etc. Even my volunteer Centennial staff members were infected with the enthusiasm. They actually came to me and thanked me for giving them the opportunity to experience the event. I finally realized what was happening. We were not a gathering of adults come to honor our favorite author. We were a lot of children who had always been forced to play alone at home with our favorite toys, now brought to a playground full of other children with the same sorts of toys, all wanting to play the same sorts of games. We were beside ourselves with the joy of it all. Several participants came to me in private to ask who was paying for everything. They offered to help cover the costs of the Centennial beyond that covered by the entry fees. They could not believe that it had been put on for the $100 entry fee that each had paid! I mentioned the wooden propeller earlier. All the pilots present, and there were quite a few, lusted after it at first sight. Shirley gave it to Richard Bach, on the condition that he leave it in his will to the Nevil Shute Memorial Library in Alice Springs, Australia. That was a very touching and appropriate gesture - a gift coming from a pilot and writer, and going to a pilot and writer. I was not present to see this, but those who were said Richard was in tears. I hope he will forgive my mentioning this. Shirley had offered the portrait of her father for sale, again with the request that it be left to the library in Alice Springs. One of our participants bought it, on the condition that I keep it for the next year or two! He didn't want to put it in storage and is apparently in the process of deciding where his retirement home will be. As a result, Nevil's portrait is now in a place of honor in my home, presiding over my collection of his work for the next year or so. The Centennial also seemed to have a considerable effect on Nevil Shute's daughters. They both spoke on how it had given them a new perspective on their father. They were quite touched by such an outpouring of love and admiration for him. "Here Dan - Let's see if you need to embellish this!"